Medicinal uses: Dried roots and rhizomes used as an expectorant for treatment of coughs and bronchial catarrh. Traditionally used as a bitter tonic, stomachic carminative, cholagogue, diaphoretic, and diuretic. Root used against several intestinal parasites and for infections of urinary tract. Externally used as antiseptic to treat skin conditions. 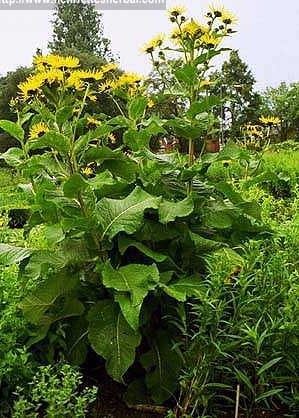 Additional uses: Elecampane root has been used in the past as a flavoring for sweets. The root itself can also be candied as a sweet itself (Kowalchik 183). Cautions: Can cause skin reactions. Do not take internally if pregnant or breastfeeding.